These chinos from ASOS.com are my life! lol I bought 5 pairs from their website and they've been my absolute favorite. I finally got a chance to use my Steve Madden shoes. Those colored soles had me sold the minute I found them. I picked up this blazer at a thrift store a few months ago. 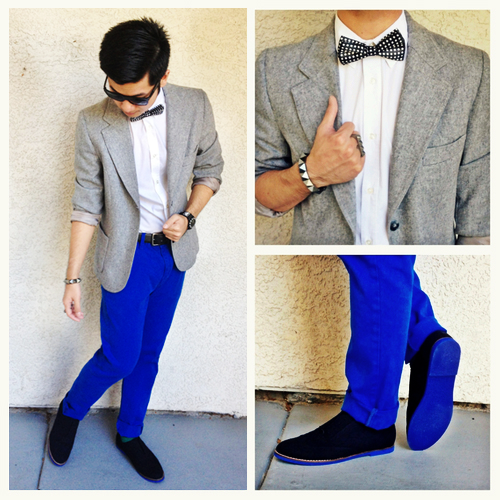 I like the combination of the gray blazer and the vibrant blue chinos with the polka dot bow tie. I definitely had fun with this look. Do you have a better picture of those Steve Maddens?